(EAST BOSTON - Tuesday, September 12, 2017) - Mayor Martin J. Walsh today joined local community members in East Boston to celebrate the grand re-opening of Bertulli Park in Central Square, following an $8 million investment in the comprehensive redesign and reconstruction of the park. The project completion marks a significant milestone achievement for Go Boston 2030, Boston's comprehensive transportation planning effort, which identified Central Square as a high priority area for streetscape improvements to increase safety and accessibility. "I am thrilled to see such an amazing transformation here in Bertulli Park," said Mayor Walsh. "Concrete has been replaced with a beautiful, green parkland and a host of other amenities that welcomes East Boston residents to visit, relax and enjoy Central Square. I thank all of our partners in the East Boston community who worked side by side with the City of Boston to make this renovated park a reality." The park now welcomes people with 97 new trees and related green infrastructure, updated pavement, new LED lighting and seating, and new bicycle facilities. Streets surrounding the park have been redefined to ensure safe and consistent roadway conditions. The installation of green infrastructure in the form of permeable pavement that allows stormwater to feed the roots of the new trees instead of sending it to drainage pipes and Boston Harbor. "Restoring the basic beauty of the park, enhancing it with contemporary elements, and using current techniques to prioritize safe access between the park and the surrounding area, will ensure that Central Square continues to be a popular destination point for the East Boston community for years to come," said Boston Transportation Commissioner Gina N. Fiandaca. "The top project to emerge out of the Go Boston 2030 citywide transportation plan was Walk and Bike Friendly Main Streets Districts, with Central Square featured as a prominent example," said Chris Osgood, Chief of Streets. "The new design transforms the area from a sea of asphalt to a walkable, green, and safe environment." "We're so grateful to Mayor Walsh for again investing in the East Boston community. 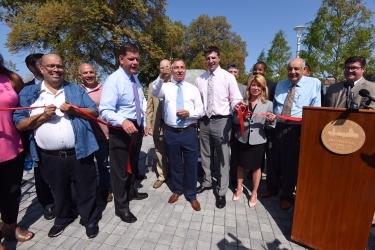 The newly completed Central Square project is a beautiful example of work being done to benefit the community," said Max Gruner, Executive Director of East Boston Main Streets. "I am so excited to see the space activated and used by East Boston residents, and I am certain that this project will increase foot traffic to benefit small, local businesses in Central Square." During the design process, the Charles River Watershed Association and the Boston Water Sewer Commission (BWSC) worked with a Neighborhood of Affordable Housing youth team to study how Central Square could include green infrastructure to help manage stormwater and improve climate resiliency. The Boston Water and Sewer Commission then partnered with the City of Boston's Parks and Recreation, Transportation, and Public Works Departments to include green infrastructure elements, and the Bertulli Park reconstruction became a BWSC stormwater demonstration project. BWSC worked to make the design mimic nature, wherein the ground soaks up precipitation; countering the effects of typical urban development with hard impermeable surfaces, which can lead to polluted stormwater runoff. Central Square was redesigned using porous asphalt and concrete which, along with permeable pavers, allow for normal traffic flow and parking while providing a pathway for stormwater to reach the ground beneath. "Boston Water and Sewer Commission has an unwavering commitment to keep our waterways clean, and we are honored to be a part of Mayor Walsh's vision for a more sustainable Boston," said Henry Vitale, Executive Director of BWSC. "Green infrastructure in Central Square will improve the quality of stormwater entering nearby Boston Harbor, while creating a beautiful streetscape that East Boston residents will no doubt enjoy." At a press conference held in Central Square in April 2017, Mayor Walsh presented his $2.08 billion proposed Fiscal Year 2018 - Fiscal Year 2022 (FY18-FY22) Capital Plan, which makes critical investments in the City's infrastructure in every Boston neighborhood, guided by Boston's citywide plan, Imagine Boston 2030. Mayor Walsh's FY18-22 Capital Plan, drawing on City, state and federal sources, will invest $709 million over the next five years in implementing the core initiatives outlined in Go Boston 2030: streets that are safer for all users of our roads and sidewalks, particularly pedestrians and cyclists; travel that is more reliable and predictable; and quality transportation choices that improve access to interconnect our neighborhoods for all modes of travel. "It's good to see this project in such a public place where people can see it and learn from it. Boston needs lots more projects like this, especially with sea level rise and heavier rain storms increasing our flood risk," said Kate Bowditch from Charles River Watershed Association (CRWA), one of the organizations that helped with community outreach as well as design components of the project. "One of the best parts of this whole process was working with the Chelsea Creek youth leadership crew from NOAH (the East Boston Neighborhood of Affordable Housing). They really got excited by these ideas, learned a lot, and were tremendous advocates, making presentations to the community, and to the project team and city departments. They deserve a lot of credit for making this a reality." "The new design is a lot more pedestrian friendly and orderly," said Philip Giffee, Executive Director of NOAH. "I especially like that there are more trees and a new permeable stormwater system that will help keep them watered. I am proud that the NOAH environmental youth crew was so involved in giving feedback on these important issues that led to an attractive, revitalized public space for people in East Boston." The City of Boston would also like to recognize WalkBoston for their assistance and contributions to this important project. With this project, Imagine Boston 2030 is building on Go Boston 2030 by tying together investments in the open space, and environmental sustainability to create a vibrant public space that can be enjoyed by all. Imagine Boston 2030 is committed to expanding green-infrastructure and other nature-based systems to improve Boston's ability to manage stormwater, reduce runoff to improve water quality and mitigate the urban heat-island effect. Go Boston 2030 is the City of Boston's long term mobility plan. It envisions a city in a region where all residents have better and more equitable travel choices, where efficient transportation networks foster economic opportunity, and where steps have been taken to prepare for climate change. Whether traveling by transit, on foot, on a bike, or by car, people will be able to access all parts of Boston safely and reliably. A list of projects and policies have been developed that are being implemented as early action projects in the near term, and a set of long-term projects and policies are intended to be implemented over the next 15 years.